Roast nuts and sunflower seeds in a frying pan until they get color and there is a nice smell. Mix them in a blender and add the rest of the ingredients. MIx in the blender. Cook the pasta according to the intructions on the package. 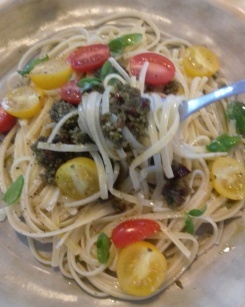 Serve the pasta with the smoky pesto and sliced cocktail tomatoes. Sprinkle some olive oil on top and some salt and pepper.